20 | YOU AT YOUR BEST | nwAdg.cOm/YOUATYOURBEST nOvEmBER - diABETES | SATURdAY, OcTOBER 27, 2018 Washington Regional Medical Center has been honored with the Governor's Quality Award for Performance Excellence. This is the highest level of recognition offered through the Governor's Quality Award Program, presented to organizations that have demonstrated excellence in organizational performance. 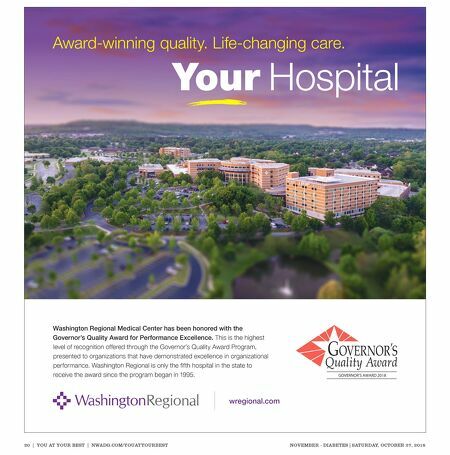 Washington Regional is only the fifth hospital in the state to receive the award since the program began in 1995. wregional.com Award-winning quality. Life-changing care.